My talented friend Lisa of the red thread is hosting a once-only online garage sale with her back catalogue of artworks available for at least 50% off! 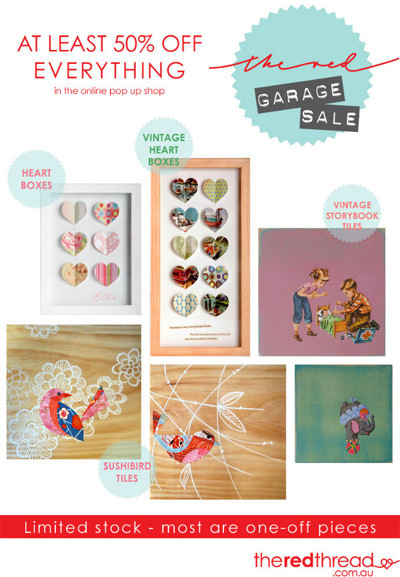 Head over to the red thread garage sale pop up shop to grab yourself some great artwork at a bargain, including SushiBird Tiles, vintage Heart Boxes, vintage Storybook Tiles. Gorgeous for kids' rooms. Hurry - this is the last of Lisa's artworks and most are one-off designs. They won't last long, and won't be released again. Happy shopping!